Shuffle your stack. Trash the top card of your stack. Gain Xcredit where X is equal to the install cost of that card. Unreliable. It might pick ANY card in your deck, including another Windfall, for which you would get zero credits. Only gets you credits. Credits are good. Lots of credits are very good. But... they're an intermediary to winning the game. To be regularly useful, it must get you an average of 3 MINIMUM. That means you need to run lots of expensive cards, which means you need lots of economy. However, that economy better not be events, because those each count as 0 against your "average cost". If it gets you less than 4 credits on average, Sure Gamble would certainly be a better choice in a deck stacked with expensive cards. The only way of modifying your average cost in-game is somehow filtering out your cheap cards. Replicator or Paige Piper could do that for you, but would be a huge waste if that's their primary purpose. 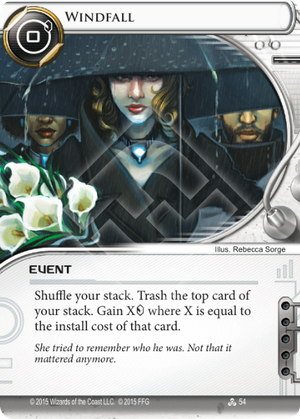 So, you're locked into a resource (or maybe Magnum Opus) based economy plus relying on an event to get you money, which gets worse when you play good event economy cards like Sure Gamble, and worse when you play more recursion. Hard to see an upside, no matter which way you look at it. Does Windfall pay out on events or does the card trashed have to be installable (Resource/Hardware/Programme)?